Technical Physics is a journal that contains practical information on all aspects of applied physics, especially instrumentation and measurement techniques. Particular emphasis is put on plasma physics and related fields such as studies of charged particles in electromagnetic fields, synchrotron radiation, electron and ion beams, gas lasers and discharges. Other journal topics are the properties of condensed matter, including semiconductors, superconductors, gases, liquids, and different materials. 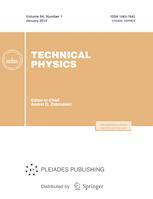 Technical Physics is a peer reviewed journal. We use a single blind peer review format. Our team of reviewers includes over 130 reviewers, both internal and external (95%), from 5 countries. The average period from submission to first decision in 2017 was 50 days, and that from first decision to acceptance was 40 days. The rejection rate for submitted manuscripts in 2017 was 20%. The final decision on the acceptance of an article for publication is made by the Editor-in-Chief or the Deputy Editor-in-Chief or the Section Editor.